The ancient vault inside the State House was recently opened. 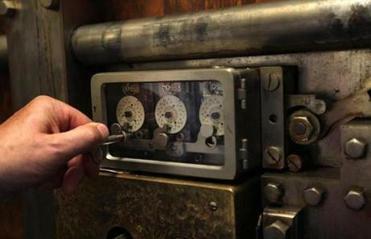 Inside an ancient vault in the heart of the State House, past two massive steel doors with timed locks, sits an ornately decorated safe, the size of a small car. Until recently, no one there knew the combinations to its locks or what, exactly, was hidden inside. Longtime staff members in the treasurer’s office, where the walk-in vault is located, say the safe within has been locked as long as they can remember, at least two decades, the codes to open it lost as employees came and went. 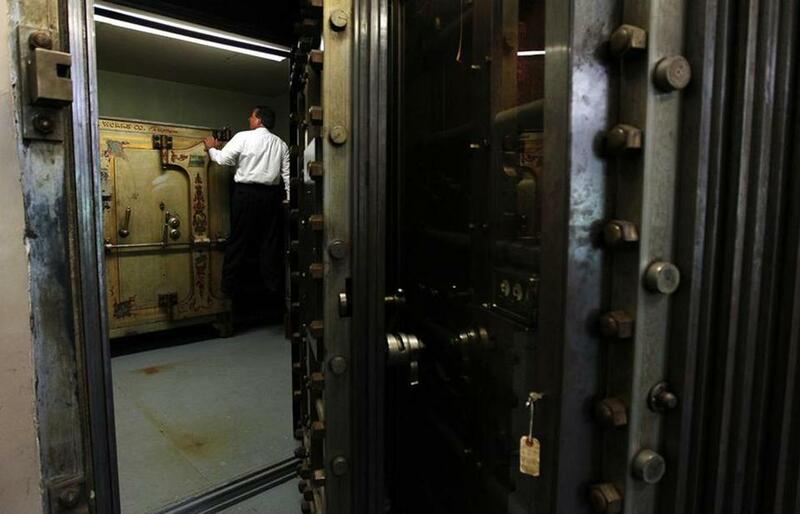 But this month, after inquiries from a Globe reporter, state Treasurer Steven Grossman acknowledged that he, too, wondered about the contents of the safe, which probably dates to the 1890s. He brought in two professional safecrackers to open it. On a recent Friday, two men from the Boston Lock & Safe Co. went to the second floor of the State House, walked into the storage vault, and drilled small holes by each of the safe’s two combination locks. They snaked a fiber-optic scope into each hole, peered into the lock, and deciphered which alignment of its wheels would release the heavy doors. In the musty vault, safecracker Ryan Krakowsky said he felt a particular thrill as he was getting ready to open the safe’s doors. He has cracked a lot of safes. But this one, made by the long-defunct Cambridge-based Damon Safe & Iron Works Co., was intriguing because it dated to an era of bowler hats on Beacon Hill. 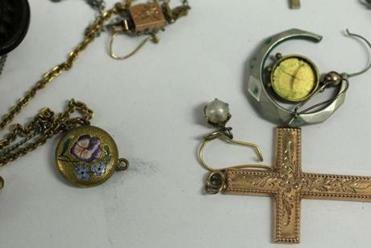 The safe contained what MacDonald called “costume jewelry,” including a bronze cross necklace and a Masonic ring. The jewelry will be turned over to the state’s unclaimed property division, which will auction it off on eBay. “These were top-of-the-line safes, the Cadillacs of their day,” said his partner, Chip Joaquin. A reporter was not allowed inside as they did it; no one wanted to disclose too many details of how to crack a safe. First Deputy Treasurer Jim MacDonald, a 38-year veteran of the office, speculated that behind the doors were expired bonds. He said he was quite certain no one was going to find a stash of gold bullion or a sack of cash. Until the early 1990s, state employees and members of the Legislature could cash their checks at the treasurer’s office, which kept about $1.7 million in cash on hand for each month’s payroll. But MacDonald, who for years oversaw those transactions, said the money was never kept in this particular safe. He recalled, however, once being told that sometimes small items of unclaimed property had made their way in there. When the safecrackers gave MacDonald the signal that the locks had been opened, he lifted the metal bar across each of its doors and pulled the safe open, revealing two green filing cabinets and big piles of papers, boxes, ledgers, and envelopes stacked on shelves. A dusty assortment of artifacts, at least one dating to the 1700s, greeted him. The items included Confederate money from 1864; a weathered ledgerbook, dated 1896-1899, outlining pay for “Massachusetts volunteer militia service in Spanish-American War”; World War I savings bonds; boxes of old checkbooks; and metal stamps with the engraved signatures of former treasurers, including Foster Furcolo, who became the state’s 60th governor in 1957. Also interred in the safe were a very old photograph of an elevated train, a 1936 stock certificate from the Boston Beer Co., and a role of magnetic tape from 1971, probably containing old computer files from the era long before thumb drives and cloud computing. No one could say for sure why such an eclectic collection of items found itself socked away in this one safe. Mixed in with the papers was an assortment of items that looked as if they were out of a thrift store, what MacDonald called “costume jewelry.” They included a bronze cross necklace and a Masonic ring, probably left in a long-ago abandoned safe-deposit box. Treasury staff members said they had no idea where the item was from or its significance. But that note and other historical documents from the safe are set to be examined this week by a specialist from the state archives. The jewelry, they said, will be turned over to the unclaimed property division, which will auction it off on eBay. With nothing to identify its rightful owner, MacDonald said, there is not much else that can be done. One question answered deep within a State House vault is plenty for a single summer. “We solved our mystery,” he said.